Flowers have long been a great way to express yourself when words fail you. These natural symbols have become synonymous with different occasions or ways we want to tell others about how we feel. With those flowers, the power of color within those flowers furthers those sentiments. Red has always been associated with romantic love, desire, and seduction. This is because it’s the closest way to symbolize the heart and a great way to show your love to a special someone. 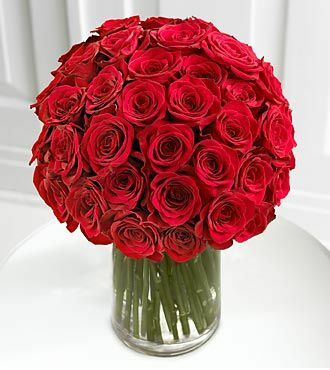 Red roses, tulips, and carnations are often used. Orange is the color of joy and happiness with the sense of warmth shining through. These are great for birthdays, celebrations, get-well sentiments and just-because moments. 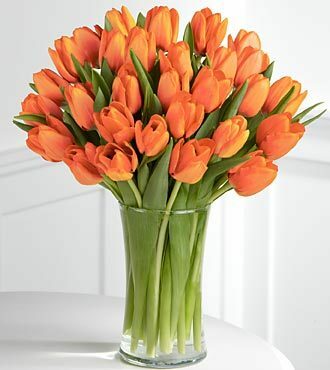 Orange tulips are always a great choice. Pink represents innocence and playfulness with some sense of love as well as femininity. These are great for new additions to the family, birthdays, anniversaries and love. Some favorite pink flowers include carnations, roses, and chrysanthemums. 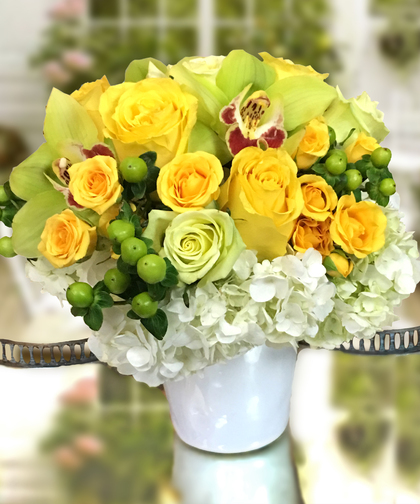 Synonymous with friendship, yellow flowers also symbolize compassion, trust, and respect. They are often used for workplace and friendship occasions. Some favorite yellow flowers include tulips, roses, daffodils, lilacs and chrysanthemums. Green represents nature and also good fortune as well as harmony and balance. Some great examples of green flowers are the calla lily and hydrangea. 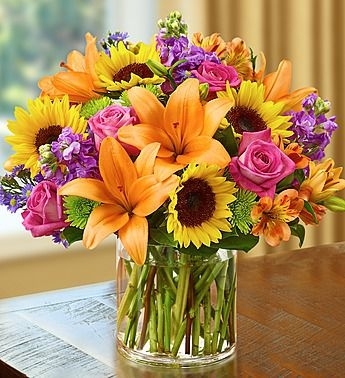 It’s a good choice when sending a get-well bouquet. As a calming color they are often used to represent trust, sympathy, or wishes for better health. One of the most beautiful blue flowers is hydrangea. Purple symbolizes grace, elegance, regality and refinement as well as romance, mystery, and creativity. 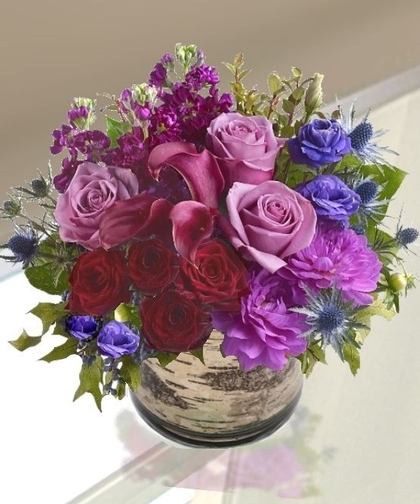 There are numerous kinds of purple flowers that you can use to send messages for birthdays, congratulations, and love. White represents purity and innocence as well as perfection and honesty. 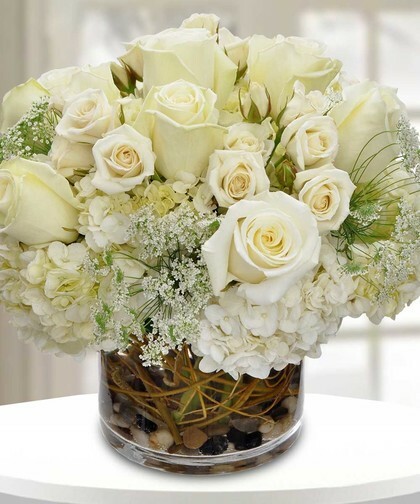 White carnations, roses, daisies, orchids and calla lilies work well for bridal showers and weddings, anniversaries, and often for funerals or sympathy messages. Lastly, when you mix colors in a flower arrangement or bouquet, you are offering many sentiments in one through numerous symbols. This could be a way to show love, friendship, best wishes, and care and concern all rolled into one floral gift. Come work with our floral designers to share your sentiment with those you want to send flowers to. We can come up with the perfect way to show your emotions during times of joy, sadness, celebration and reflection.